If you are keen on learning the art of applying airbrush makeup, here are few tips and tricks that will help you get started. 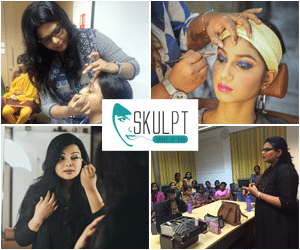 Learn from the pioneers; one of the best makeup academy doles out expert advice on airbrush makeup. Apply foundation – Tie the hair in a bun and apply some moisturizing lotion. Hold the nozzle of the tool at a distance of 6 inches away from the face. In a circular motion, you can conceal under dark eye circles, blemishes and age-related scars. Try without makeup–Experts say it is best to start off without makeup, so you get an idea of the airflow on your skin. Light contouring– Hold the spray 4 inches away from the skin and spray the makeup near the jaw line, beneath the cheekbones and close to the temples. It is sufficient to use 3 to 4 drops of the desired colour to get an even appearance. Eye-shadow shield– to minimize the effects of over spraying, use a shield. You can apply few drops of lotion into the airbrush and give your face a dewy look. Here’s what some of the professional makeup artists courses tell you. Clean your face– An airbrush foundation comes in water base as well as a silicone-based foundation. Before applying any makeup, clean your face and apply some lotion. Hold the nozzle at a distance– fill the airbrush with a small quantity of the desired colour or foundation. Hold the device at a distance of 6 to 8 inches and pull the trigger to start the airflow into the system. Move in a circular motion– move the stylus in a circular motion near the areas that requires makeup. Remember to keep the device moving, holding the hand steady at all times. You will need a compressor, a hose that connects the wand and compressor, desired makeup colour or cream and some mineral water. You have a choice of a silicone-based or a water-based lotion. You can go for the former as it helps create a clear and uniform appearance. If you face the dilemma of choosing the right airbrush kit, you can be assured that most of the brands do not test their products on animals. You can even share your kit with others at a bridal party. Since there is no contact with the skin, it is extremely safe and hygienic to use them. Get creative and apply stencil tattoos and other drawings on your skin. Airbrush makeup for wedding has become new trend which brings beauty into the digital age with professional bridal makeup artist.Brides have another reason to pose for photographs. They know that their makeup is smudge-free and can last as long as 15 to 17 hours. No amount of sweat, tears or water can spoil them. Get a trained stylist to do the makeup for you or join any of the academies in your city to get complete support on the latest makeup techniques. With the right colour, makeup and attitude, you can turn create wonders with an airbrush makeup.